I'm amazed at the energy that my new little Roborovski hamsters display. They're like little elastic balls bouncing around the cage. Their level of activity means that I'm going to have to buy a new cage but in the meantime I decided to get them some new toys. 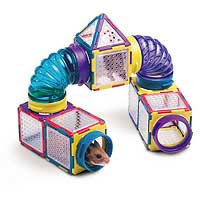 I went into my local petshop on Camden Street today and bought the Super Pet Puzzle Playgrounds Junglegym - talk about a mouthful. Assembling the damn thing proved a wee bit frustrating - to be honest it nearly went out the window a few times. It looks simple - a snap together assembly, but in reality, if you apply too much pressure, it just falls apart and you have to start again. But it's been worth it. The hamsters are now buzzing around the assembley and they've already moved past the stage of trying to eat it. I tried to take some photos, but the little fellas just move too fast. Here's the best that I've gotten so far.